Constructing and operating the Manhattan Upper East Side garbage transfer station will be more than two times the cost of continuing to export waste to landfills in New Jersey and upstate, according to an analysis by the city’s Independent Budget Office released on Wednesday. The nonpartisan agency estimated that completing construction of the station on 91st St., and operating the facility, would cost $632.5 million, as opposed to the cost of exporting waste out of the city for another 20 years, which would cost $253.2 million. The station, slated to finish construction by March 2016, would collect trash from around Manhattan, then pack the waste into containers. The containers get placed onto barges, to be transported to landfills outside the city. A number of community groups, residents, and local elected officials have long opposed construction of the garbage station, citing a number of reasons against its existence, including health hazards associated with the air pollution that they say will result from operating the facility. 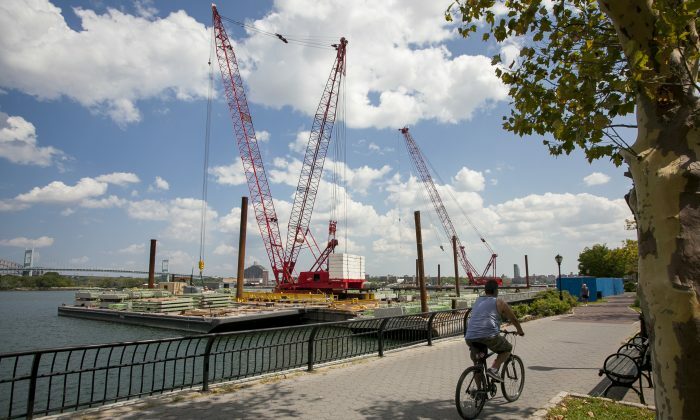 They also have cited safety concerns over garbage trucks frequently traversing the neighborhood, and potential flooding—as the station is being built over the East River. The city is building the Upper East Side station as part of its latest 20-year waste management plan, which it says aims to distribute trash disposal more evenly among the five boroughs. Currently, Manhattan is the only borough without an operating garbage processing facility, and some of its trash is carted daily to facilities in other boroughs. Most go to landfills and incinerators in New Jersey and upstate. Transporting the trash by water would also have less environmental impact than the tractor-trailer trucks that use up diesel fuel to bring the trash to landfills, the city argued. The office projected that the total cost per ton for the first year of operation at the 91st St. station would be $278, compared with $93 per ton under current trash disposal plans. But the office also noted that if the city were to forgo the Upper East Side project, the cost of stopping construction, terminating the contract, and securely closing the site would be about $46.5 million. As the city moves forward with its plan to build a much-debated garbage transfer station, the neighboring sports complex Asphalt Green responded by developing an alternative plan.